Office Space - Bielefeld, North Rhine Westphalia. 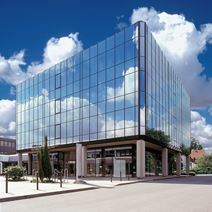 Close to the centre of Bielefeld, these bright office spaces are modernly furnished and equipped with advanced telecommunication systems and spacious meeting rooms. They benefit from a wide range of services, including secretarial and telephone services and from a convenient location: well connected to the motorway and well served by railway and underground. There is a great selection of restaurants within the centre's locality at which you can impress colleagues and clients alike.